The motley crowd was running out of patience as it waited under the harsh sun for Chief Minister H D Kumaraswamy’s campaign to begin at Gejjalagere. Tired, some even left. “Before coming here, I offered flowers at the memorial here to mark the sacrifice of farmers,” Kumaraswamy said from atop his campaign vehicle. He was canvassing on the very street that witnessed, 37 years ago, police firing in which two agitating sugarcane farmers were killed. 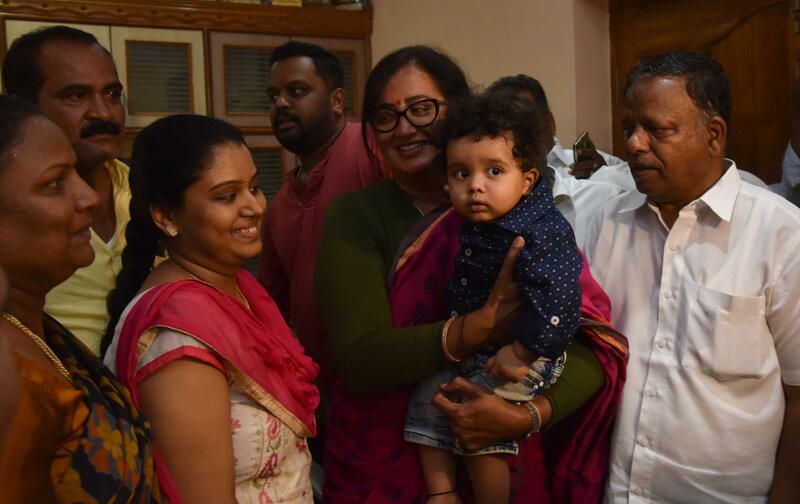 “You must remember my family stood with you back then,” Kumaraswamy said, hardselling his son Nikhil’s candidature by invoking the infamous police firing. This is just one of the many ways Kumaraswamy is trying to beat the palpable resentment against family politics in the JD(S), triggered especially after the party chose to field Nikhil from Mandya and Gowda’s other grandson Prajwal from Hassan. 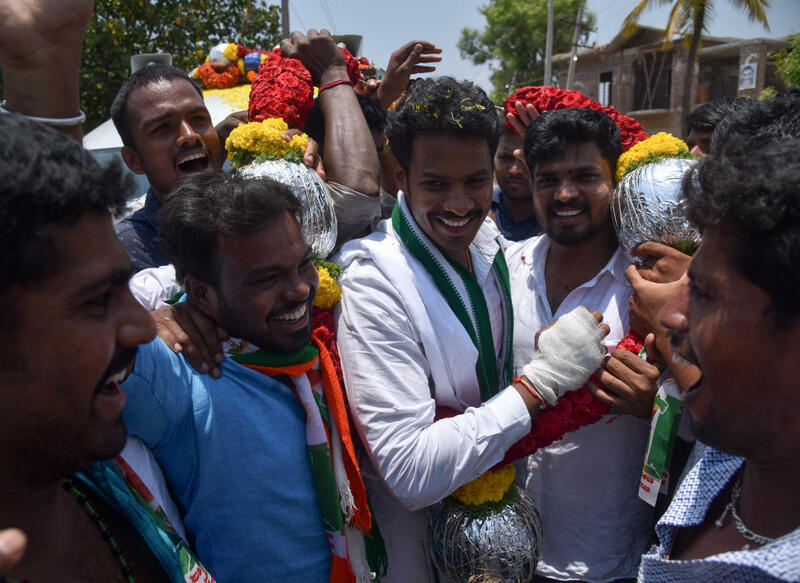 While loudspeakers blared the message that Nikhil was the candidate of the JD(S)-Congress combine, a contrary development was taking place at another end of the constituency. Independent candidate Sumalatha, who is giving Nikhil a fight tougher than expected, was savouring lunch at the house of a Congress leader named Rajashekhar. He is supporting Sumalatha, running the risk of suspension from the Congress for ‘anti-party’ activity. But he says he gives two hoots. locals shouting ‘Long Live Ambareesh’. “Remember, I’m a member of your household... your family,” says Sumalatha, kickstarting her canvassing. Mandya is known to be a JD(S) bastion and the Vokkaliga community is the most dominant here. Voters, however, appear to be caught between two families seeking to connect with them emotionally, clearly indicating that the fight between Nikhil and Sumalatha could go right down to the wire. The divide was apparent when Nikhil’s campaign reached the quaint, narrow lanes of Kannali and B Gowdagere. Some students in their early 20s were locked in a heated argument - some in favour of Nikhil and some for Sumalatha. “I’m a huge fan of actor Darshan, but my love for him is confined to entertainment. For politics, I’m for Kumaraswamy. His son’s victory will do Mandya good,” said commerce student Rakshith C L said. But Yatish Kumar M B declares Sumalatha will win. “When Ambareesh was alive, no one dared to speak. Now that he’s gone, the knives are out. Ambareesh was from Mandya and so is his wife,” he says. On his part, Kumaraswamy - who is fighting his son’s election as if it is his own - is seized of two things. “The BJP, a section of the Congress, the Raitha Sangha and local media are supporting the independent candidate,” he says. “But my son will win this election with a minimum lead of 3 lakh to 4 lakh votes,” he said.